Well now, isn’t that just a lovely thought? Cinnamon & Sugar in a butter cookie? Why didn’t I think of that before!? I actually call these “Norwegian Snickerdoodles” because they come from my grandma’s Norwegian almond butter cookies recipe (sandbakkelse) all dressed up like a snickerdoodle! This recipe uses my favorite buttery, dense norwegian shortbread base, with a lace of cinnamon and a dusting of cinnamon-sugar on top. And the best part – there are only 6 ingredients, that I’m almost positive you have in your kitchen right now. All good things, right? Yes, I know it’s similar in concept to a Snickerdoodle, but not being a huge Snickerdoodle fan myself, I am much happier with these. 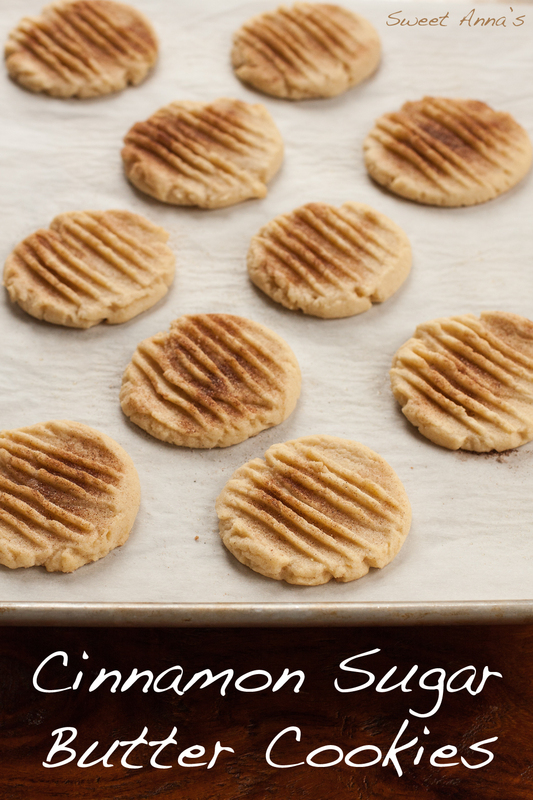 Give these a try the next time you are craving a cinnamony, buttery treat but yet you just don’t feel like getting your hands dirty. (Does anyone else get tired of the mess of rolling cookies in sugar, like I do?!) These are a much quicker, much butterier (Is that a word?!? ), and much cleaner cookie to make. Oh you guys. I wish you could just SMELL these cookies. I really do. Even if you can’t eat them (diet, allergies?!) please just make them to enjoy the achingly cozy aroma (and then give them to your friends or neighbors!). All the glorious smells of fresh homemade cinnamon rolls, in a fraction of the time and effort. Make these once and you’ll make them again and again. I promise! Preheat the oven to 375ºF. Line several baking sheets with parchment paper and set aside. In a large mixer bowl, cream together the butter and sugar until very light and fluffy, about 3-5 minutes. Beat in the egg, salt and cinnamon until well mixed. Mix in the flour, on low speed, until just well combined. Scoop the dough (using a spoon, or a medium pastry scoop) onto the parchment-lined baking sheets, at least an inch apart. Press the balls of dough down to about 1/4" or so thickness with a fork dipped in cold water. After you have pressed down all the dough on a cookie sheet, go back and generously sprinkle each cookie with the cinnamon and sugar mixture. Bake for 8-10 minutes, until just set and very lightly golden brown around the edges. Let cool completely before storing in an airtight container in the freezer for several weeks!